Frying Pan Lake at Waimangu is one of the world’s largest hot pools: 38,000 square metres in area, and fed by numerous acid springs. 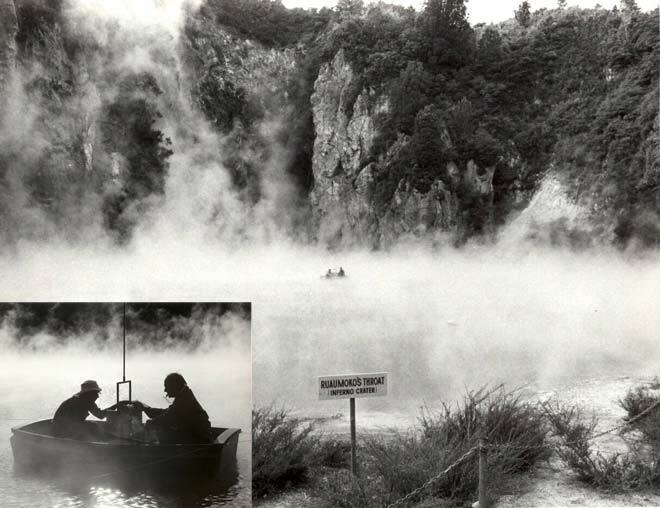 The lake fills part of a crater formed by the 1886 Tarawera eruption. It has a flat floor, mainly about 6 metres deep, although some vents are up to 20 metres deep. Lake temperature is generally between 45 and 55°C. Between 1976 and 1978 Ron Keam (University of Auckland) undertook a detailed bathymetric survey of the lake, using a specially designed wooden dinghy named Maji Moto. The inset image shows Keam (left) and a companion taking a sounding. Download the document (1.7 MB) to read Keam's scientific report describing the survey.